From the airport to the Villa only took us 10 minutes which was driven by our packaged chauffeur in a tidy minivan, it was a braze. When arrived, loved the spacious ceiling height and the humongous tall doors, not everyday you get to walk into a space like this! It is a great space for all of us to gather for the full 6 days we stayed. The pool size is adequate and the garden was spacious too. The rooms are great, we all found the mattresses are Extreme supportive and comfortable, without that old sunken used feeling, which I found in most villas and resorts. The chef! She is a great cook, and we asked for a more traditional local Thai style dishes spicy!! Basically any dishes you can find on the island “she can”. 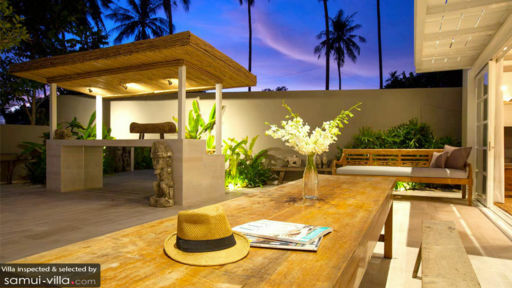 Basically a must go villa, we highly recommend it. Thanks again for having us. Our family spent the most wonderful week at the Villa Akasha in May, 2016. Such a beautiful villa. The three king bedrooms and ensuites were stunning as were the living areas. It was so easy to spend time together and also plenty of space for the quiet times. Perfect for our adult family of six, or any family or group of friends for that matter. The Villa is in a lovely quiet area - away from the madding crowd, but so easy to get to anywhere! Cheong Mon - a beautiful beach, is only 5 minutes away. Chaweng for night life – 12 minutes, and Bohput – for the Friday night fishermans markets and great restaurants, about 15 minutes away. To get to the west coast to watch the amazing sunset was only an hour’s drive. The two ladies who were with us every day, looked after us so well and were most helpful - and not intrusive at all. An, especially, helped with organising drivers, booking restaurants, scooter hire, etc - nothing was too much trouble. Breakfast every morning was an absolute treat. And thanks to the recommendation from the villa owner, we had a superb day trip to Ang Thong Marine Park with Samui Boat Charter. I still miss having my morning coffee brought to me, while relaxing in the cabana by the pool and reading, while all still in bed - bliss! A beautiful place to spend time with our family. Thank you Villa Akasha for making our first trip to Koh Samui such a memorable holiday. Looking forward to our next stay with you. We spent a week at Villa Akasha in October and even though the weather was not great we had a fantastic and peaceful holiday. The villa is beautiful, simple and homy. The high ceilings and the large rooms give serenity to the place. There is something very special about Villa Akasha, it feels secluded, tranquil and energising, all at the same time. We took our time, stayed by the pool, had great Thai food, relaxing massages and terrific yoga classes. We did not have a car but had a lovely and very reliable taxi driver on speed dial and it worked pretty well for us. The two ladies who look after the house are very helpful, efficient and extremely caring. We stayed there with our teenage children (they loved it too) and we are impatient to go back. 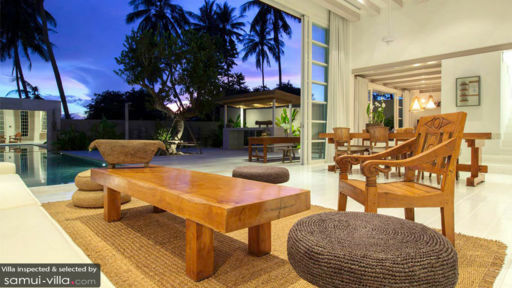 Villa Akasha is a perfect designed, stylish 3 bedroom villa. Even not located directly by the beach, you can overlook the beautiful, typical Koh Samui landscape, get a glimpse of the sea and enjoy romantic sunsets. The beaches are 10 minutes away walking distance and therefore no tourist crowds but serenity. The three spacious air-conditioned guest rooms offer king size beds adomed in luxurious linen and modern en suite bathrooms. Starting by the huge, open living- dining, tv-room, which you can open fully to the stunning pool and outdoor areas, villa Akasha offers an unique atmosphere of peace, tranquility and luxury. Thats exactly what we were looking for. I personally loved the two big trees which give a special character to the terrace. The two Thai-ladies who serve are very friendly, discret and cook fantastic Thai food. Don't miss it! Villa Akasha is perfect for families or couples who are looking for a top 5* luxury hotel holiday without the hassle of a hotel but instead privacy and personal service.